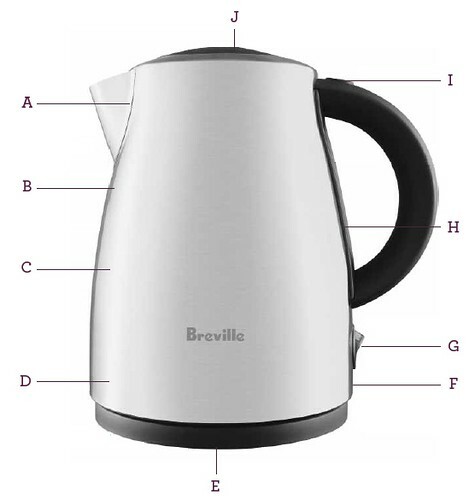 The Breville® Moda™ Cord-free Kettle – Push button controls, a 58 oz carafé and a powerful 1500W element. 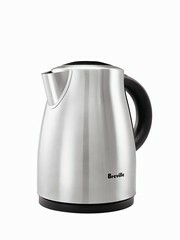 This kettle is portable, quick and quiet, as well as being a beautiful addition to any counter top. A. Removable Scale Filter. B. Brushed Stainless Steel Finish. C. 1.7 Liter Capacity. D. 1500W Concealed Element. E. Multi-Directional Cordfree Base. F. Auto Cut-Out and Boil Dry Protection. G. Illuminated 'ON'/'OFF' Switch. H. Water Window. I. Lid Release Button. J.